Following on the heels of a final Fatah-Hamas unification agreement that will see the Fatah-controlled Palestinian government gain control of Gaza by December 1st, Palestinian President Mahmoud Abbas has stated that Hamas ministers entering the unity government must recognize Israel's right to exist. This is a significant development in that Hamas has never recognized Israel. This will put significant pressure on Israel to agree to a peace deal. Keep in mind that this is total doublespeak on the part of Abbas since he says one thing to his western, English-speaking audiences, and a completely different thing to local Arab media. In my estimation we are witnessing the Psalm 83 or a Psalm 83-esque conspiracy developing since Egypt, Saudia Arabia, and Jordan have all made "nice" with Israel in recent months. The Israeli government is saying relations with the Sunni Arab world have never been better and that's true from a purely superficial perspective, but what this really means is that Israel will be swindled into a peace deal, which will see the Jews' God-given land divided right through the middle. In other news, tomorrow is the 500th anniversary of the Protestant Reformation and also Yom Kippur if the barley harvest was delayed. This Thursday is the 100th anniversary of the Balfour Declaration. Two weeks from today is the long-expected "post-birth" conjunction of Jupiter with Venus on November 13th. That day also happens to be Shemini Atzeret, again - if the barley was not abib when expected this past Spring. November 13th is 50 days after the Revelation 12 Sign, exactly 12 weeks after the Great American Eclipse, 444 days since the last Jupiter-Venus conjunction, and 777 days since the Tabernacles Super Blood Moon of September 28, 2015. Thank you Gary, for the concise update. There seems to be so much to pay attention to right now, it is so easy to keep your focus on one thing for too long while something else is developing in another corner. Nothing is more important than what is occurring in Israel - our time clock. I am personally leaning toward November 13th, but I am certainly ready now! The scoffers are heavy on my heart, and my heart goes out to them, but I can only hope that some have trusted in the redemptive substitution of Jesus for all mankind. Our time is SO short! We must stay encouraged, keep watching, keep warning, and continue to appreciate how exciting it is to see it all actually unfold before our eyes! Thank you for your faithfulness and diligence in keeping us informed! Holding On to my Monitor with White Knuckles!!! EVERYDAY!!! LOL!!! ...PRAISE THE LORD!!! The reformation took place under the Julian Calendar. If you calculate using that calendar, the anniversary falls on November 13. Interesting, I thought. That's crazy! I wish I had the ability to comprehend most of what they're talking about lol.... but very cool anyway. Thanks for sharing! I love the idea of November 13, except for one thing, it is neither a Sunday or a Saturday. The September 23 sign is now 37 days past. This is October 30. I am not abandoning the Great Sign of Revelation 12 just yet. Jump from Revelation 12:1,2 to Leviticus 12:1,2 and there is a type of a male child unclean for 7 days then purification for another 33 days. Learned from Jeff on YouTube that the day after 40 days from the Great Sign is "Vayera." The "Day of His Appearing." Was that written by Moses? The title for the Synagogue reading for the Sabbath this year on November 3, 2017, was it written by Moses? For all 40 years of the wandering, each Sabbath there was a synagogue reading of the Torah and it was likely done by Moses. Now I am very interested because God will do nothing but that He reveals it first to his Prophets. Amos 3:7. Does someone know more about where the titles for the Sabbath synagogue readings come from? November 13 - is Day 777 from the Great Sign. That is wonderfully breathtaking. BUT the date on November 3 is on a Sabbath, AND .... THE sabbath that has been known for over three thousand years as the Sabbath where that day's Torah reading is named "Vayera" meaning, "The Day of His Appearing." I wonder what Jesus thought when He read those readings each year on that particular Sabbath when Vayera was read? Yes, that's pretty interesting! 11/3 is definitely on my radar. There's something interesting going on: the Ascension was 40 days after the resurrection and Pentecost was 50 days after the resurrection. Vayera is 40 days after the Great Sign and the Jupiter-Venus conjunction is 50 days after the Great Sign. It's almost like bookends for the Church Age and a reversal of sorts. The Restrainer came 50 days after the resurrection. Could the Restrainer be removed 50 days after the Great Sign? Previously I figured Jesus was resurrected on a Sunday - With that resurrection God essentially said, "OK now get to work. You have 40 days of stuff to complete before you ascend. You've got to get to the road to Emmaus for a divine appointment, then you will see the disciples a number of times, and don't forget, you will need to start building a whole lot of mansions. So get to work." First day of the week resurrection means "Get to work." The church was conceived on a Sunday - God, in essence said to the new creatures, "OK now, this is the first day of the week so get to work and preach the Gospel" Sunday, the first day of the week is a "Get to work day." Now, finally I get it, I don't think the rapture is a Sunday "Get to work day". The rapture is a "Your work is over so REST" day. It is a Sabbath. Wow! Now I am thinking that the type for the rapture is REST and thus the best day for the rapture would be on a Sabbath. AND EVERY SABBATH IS A FEAST DAY. And wouldn't that be like Jesus to do this in love, rapture His church (the rapture is work for Him) on a Sabbath and this to one more time just tick off the Pharisees in a holy manner! Lol! OK. I really have my eye on next Sabbath, November 3, where the Torah reading from old is "Vayera" meaning "The Day of His Appearing". Did Moses write that? So a few days ago, I allowed myself to consider that the rapture may happen on a Sabbath. Till yesterday I was pretty adamant that the rapture, like the resurrection of Jesus, like Pentecost also, would occur on a Sunday the first day of the week. The “first day” means get to work. The last day of the week means rest. The rapture is best typified by occurring on the last day of the week. If so, reaching rest on the day of His appearing, “Vayera” one day before the Antifa rebellion of November 4, sounds like a pretty good idea to me. The Sabbath of November 3 begins at about 9am Friday here in Southern California. Plus, Jesus' Ascension was 40 days after the resurrection. Vayera is 40 days after the Great Sign. Having the rapture on a sabbath makes most sense to me too, because we'll be immediately at the wedding feast, a day of rest per say. Then we get to work in the kingdom after that. The first day in heaven is to show us around and give us a day of rest after this life. Torah reading for November 4, 2017 is Genesis 18:1-22, 24 And the Lord appeared to him by the ooaks1 of Mamre, as he sat at the door of his tent in the heat of the day. 2 He lifted up his eyes and looked, and behold, three men were standing in front of him. When he saw them, he ran from the tent door to meet them and bowed himself to the earth 3 and said, “O Lord,2 if I have found favor in your sight, do not pass by your servant. 4 Let a little water be brought,. . ., 5 while I bring a morsel of bread, that you may refresh yourselves,. . .” “Do as you have said.” 6 Abraham went . . . . to Sarah. . "Three seahs of flour! . . make cakes.” 7 Abraham ran & took a calf, gave it to a man, who prepared it. 8 . . . . And he stood by them under the tree while they ate.. . . 22 the men went toward Sodom,. . .For the sake of ten I will not destroy it.” 33 And the Lord went his way. . .19 The two angels came to Sodom in the evening. . . . the men of Sodom surrounded the house. . . 6 Lot ..said, “do not act so wickedly. 8 xBehold, I have two daughters who have not known any man. Let me bring them out to you, and do to them as you please. Only do nothing to these men, for they have come under the shelter of my roof.” ...shut the door. 11 And they struck with blindness the men who were at the entrance of the house, both small and great, so that they wore themselves out groping for the door. . . . . 13 For we are about to destroy this place, . . . Get out of this place, for the Lord is about to destroy the city.” But he seemed to his sons-in-law to be jesting. . . . So the men seized him and his wife and his two daughters by the hand, the Lord being merciful to him, and they brought him out and set him outside the city. 17 And as they brought them out, one said, “Escape for your life. Do not look back or stop anywhere in the valley. . .24 Then the Lord rained on Sodom and Gomorrah sulfur and fire. Very, very compelling. I've been keen on Nov. 3 for a month now. It all makes too much sense. THIS scripture reading...40 days after the sign...a Sabbath. The Rapture on this day would be an unmistakable sign to the Jews that Jesus is the Messiah. No alien abduction story will fool the Jewish man that knows his Torah. He will know! 726 days till the Great Sign of September 23, 2017, Rev. 12:1,2 - Strongs #726 greek is "harpadzo". I admit, I thought it was the day but it was simply a sign that "harpadzo" is near. 746 days till Jupiter left Virgo, October 13, 2017 - Strongs #746 greek is "it is beginning or reference back to beginning" pointing perhaps back to the Great Sign or forward to rapture, or finally Jupiter is born now it begins, the time of rapture can occur at any time. 767 days till November 3 - a Sabbath, perhaps the rapture, a concealed date - Strongs #767 greek is "hidden" or "unmarked" "Hidden" is what the church will be at rapture and it describes this day also as this day is a hidden day. "Unmarked" as the church will not be marked, and the day is "unmarked". Here is hoping. But I am an experienced watcher and I do not put my hope in a day. Nice thinking about it though. Shouldn't there be a fulfillment of a feast day in the rapture? Yes. The feast day that is fulfilled is the Sabbath!!!!! Not the other 7. It is the first one mentioned in Leviticus 23. Perhaps the feast of "Sabbath" will be used to fulfill the harvest of Pentecost. Once again, wouldn't that just tick off the Pharisees? How dare He harvest on a Sabbath? Hah! The Sabbath was made for man!!!!! One more thought. The day of His Appearing and the number 40. Try thinking of this from the Father's perspective. Jesus is resurrected, BUT, He has to complete 40 days on earth, then when those 40 days are completed He ascends, and we can understand the joy the Father has as this is the DAY OF HIS APPEARING in heaven. Perhaps God is trying to give us the same experience. We saw the Great Sign, we were emboldened and encouraged by it, now we wait 40 days to be complete until the next day ... THE DAY OF HIS APPEARING. Or...we wait till November 13th...I am OK with that. Or even longer, but not much longer, don't see how that can be. Yet. Hah! Exciting time to be alive! What is the significance of December 1st? As far as I know that is just the mutually-agreed upon time for the Palestinian Authority to gain back control of Gaza from Hamas. It was a fascinating heading to say the least, however one of the bloggers noted the following "Recent report from Aljazeera: "Abbas' Fatah party issued a short statement on its social media platforms on Monday, noting: 'The presidency denies the remarks attributed to the president by 'Haaretz'. 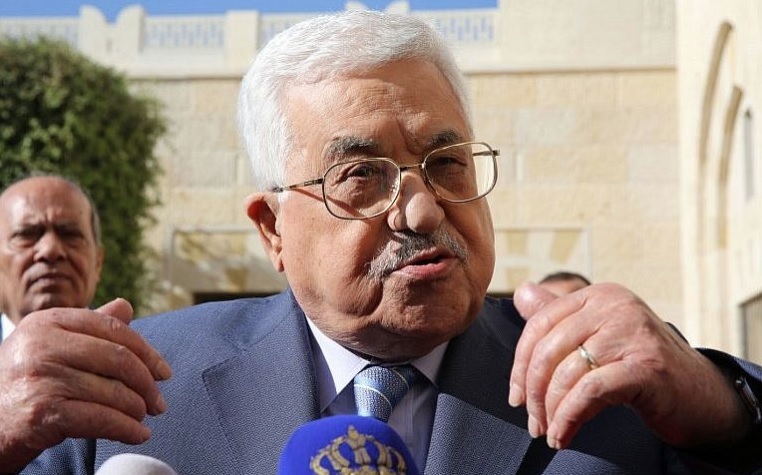 The Haaretz article, published earlier in the day, claimed that Abbas made the comments in a meeting with 12 former Israeli members of parliament who were visiting him in the occupied West Bank city of Ramallah." I'm new to these media publications, can anyone shed some light on the political ideologies of these reportings...Haaretz, Al Jazeera, etc. Thanks! The press in Israel is definitely on the left and they are actually harder on Benjamin Netanyahu than the press here is on President Trump, if you can believe it. The one I go to is Arutz Sheva which is Israel National News. They are good. Very welcome. Sometimes I check the Jerusalem Post, too. I thought Egypt, Saudi Arabia and Jordan were cozying up to Israel because they are scared of Iran having nukes, and they are counting on Israel to take out Iran's nukes with their mighty Air Force. It was the IAF that obliterated Saddam's reactor and also destroyed the North Korean built reactor in Syria in 2007. So, we will see. Friday Oct 13th 2017 I woke up and I looked at the clock and it was 2am so I closed my eyes. As soon as I did I had a very vivid vision of a long table covered with a beautiful white linen and it was all set up. The whole place was vey bright, clean, fresh and it was a very happy place. It was so clear that I felt I was right there inside the place and just observing everything. All of a sudden I was aware of a voice speaking from above. I listened, but could not understand the words. The next morning while I was praying, I asked God what was the words you were telling me and God said "Luke 17:20".....Glory to God! What about Revelations 11? Are we getting ahead of ourselves?? Just thought it was interesting that the Jewish people will be reading this on the day that is 40 days after the rev 12 sign. I find this to be exciting and amazing since this is prophetically breaking completely new ground, and it sets the stage for the 'covenant with many' to be confirmed in Daniel 9:27, which will start the 7-year tribulation. The geopolitical aspects of this are unfolding right before our eyes! If you believe in a pre-trib rapture, as I do, the rapture could occur before this covenant is agreed upon, but we are very, very close. Abbas himself, who met with Trump a couple of weeks ago in the WH, stated the agreement could be reached very soon within the coming months. There is nothing in Scripture that precludes the rapture from occurring BEFORE this covenant with many is made. I believe Shemini Atzeret (Eight Day Assembly) holds great possibilities. The eighth day holds great biblical importance. Jesus was resurrected on the eighth day! How befitting it would be for the resurrection of the dead in Christ to take place on an 8th day, and the bride to be snatched up as we are born again. God bless all of you who faithful watch, pray, and yearn to meet our Savior in the air!